When I was younger I wanted to be a guitar-wielding, vocal powerhouse rock star. After a few fledgling attempts at musical production with impromptu rock bands, I realized that my dream was limited to the occasional, recreational strumming of an acoustic guitar. Turn on the radio today, and toggle through the stations. You are bound to find variations of rock and pop. That should come to no surprise to anyone. I dreamed of pop/rock stardom, and I did so because that was what was cool. I was a musical conformist, and although at 14 years old I turned my attention to 60s and 70s rock, I was still focused on rock dreams. Davide Rigodanzo is not, and that is what makes this 14-year-old fingerstyle guitarist so special. 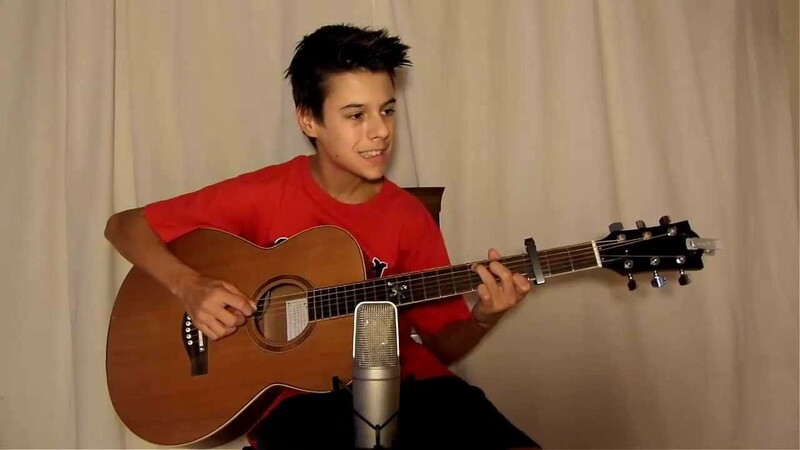 A self-taught guitarist who started playing the guitar when he was 11 years old, he has aspirations different from your normal 14-year-old music lover. Davide, a spitting image of Justin Bieber, represents keen maturity and a perspicacious appreciation of the acoustic guitar and music itself. I’ll leave you to read some of Davide’s words. You don’t hear many 14-year-old aspiring musicians talking like that. As a music lover, I have much respect for those who play the acoustic guitar well. The instrument has been slightly perverted by pop simplicity – a few chords and voila, a chart-bursting hit. I am endeared to those who actually know how to pick notes and extract emotion from an acoustic guitar so it oozes out in smooth sound. Davide is able to do that. He even gets the slaps and mutes right! Sorry, I’m getting ahead of myself. 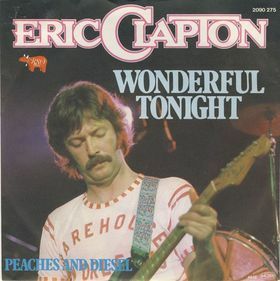 “Wonderful Tonight” is my favorite Eric Clapton song. Davide performs it with sophistication and feeling. The sound is crisp, and Davide strikes each note with intensity. He demonstrates a true sagacity in his ability to not drown the sound by playing too quickly or let the sound echo too often. It’s a wonderful mixture. I’m happy to introduce Davide to the Music Court readership. It isn’t everyday I am contacted by a classical guitarist, especially one who is 14 years old. We should all take a page out of Davide’s playbook. Don’t simply pursue something because it is perceived to be chic or profitable. Do what you love! Within the first ten minutes of the first night of Eric Clapton’s Crossroads Guitar Festival, I turned to my buddy and exclaimed, well, “that was better than an encore. Do we go home now?” Behind the attempted humor, I was serious in my sentiments.To open the show, Eric Clapton and guests greeted an enthusiastic full house at Madison Square Garden with a five-song acoustic set that drifted and jived through Clapton staples like “Lay Down Sally” and “Wonderful Tonight.” Clapton invited artists like Vince Gill and Andy Fairweather Low on stage, the latter of which sang tremendous lead vocals on his song “Spider Jivin” – the second song of the night. 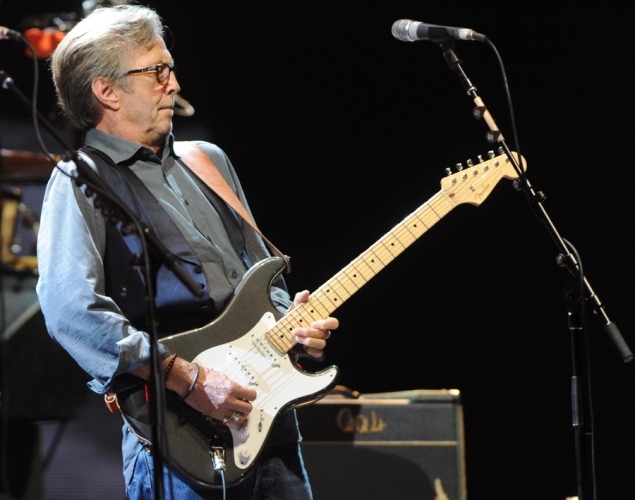 Clapton began the concert with “Driftin.” In the middle of his opening set, Clapton performed “Tears in Heaven,” which he has unearthed for his 50th Anniversary Tour. The song, written in response to the death of Clapton’s four-year-old son, is as potent as it is simple. 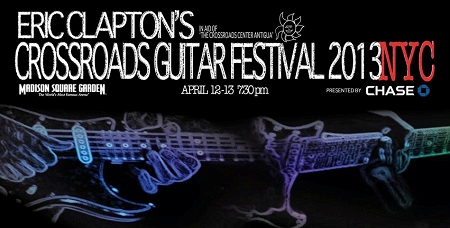 Because of its subject, Clapton rarely plays it (last time before this tour was in 2003). Hearing him perform the song live was well worth the price of admission. At the helm of the show was emcee and original Blues Brother, Dan Akroyd, who introduced artists and, prior to the concluding set by the Allman Brothers, performed a rousing version of “Got My Mojo Working” with Keb ‘Mo. In reviewing my notes from the show – and recalling my euphoric loquaciousness during/after the show, I realize now that despite my pre-show expectation to see a slew of revered guitar gods, I couldn’t quite grasp how overwhelming and ethereal the concert would be. Perhaps the “kid in a candy store” axiom might suffice in describing the crowd’s zeal, but I believe it may be a little weak. There was an infectious gregariousness to the crowd; this wonderful atmosphere of musical passion and friendship. It was as if the guitar community was coming together for a convention, a mind-blowing convention. Blues royalty. Yeah, something like that. B.B. King, who is in possession of a personal fountain of youth, was electric for the few songs he sat in on. I particularly like this performance because it highlights the spirit of the festival. As these legends (King, Cray, Vaughn, and Clapton) playfully swapped and stole solos from each other, the crowd could almost smell the aroma of blues – which to me is a mixture of hard scotch and worn guitar strings. This jam is about as authentic as you can get. It is the blues. Strip away the stage, crowd, and allure, and there would still be four individuals playing the blues. After a small set of original pieces, John Mayer summoned Keith Urban onto stage to complete a guitar duo for an electric performance of The Beatles’ “Don’t Let me Down.” There are so many things to like about this performance. A.) It’s an awesome cover of a Beatles’ song. B.) John Mayer and Keith Urban can flat-out kill it on the guitar. C.) They also can sing pretty damn well. D.) If you listen closely, the band adds several interesting influences into the song (country hints mixed with traditional blues). E.) Go to the 3:00 minute mark, refer back to B, and enjoy. 12 minutes of pure, unadulterated, brilliance. Watching the Allman Brothers Band is always a treat, but they brought it to a completely different level for this concluding performance at Crossroads. The solos were that much more inspired, and the band played with some extra fire and oomph that propelled the song to the apex of awesome. Listening to the jam-packed crowd, five hours into the concert, belt out the familiar lyrics like it was the opening song was also spectacular. Legendary show! And, all for a good cause.